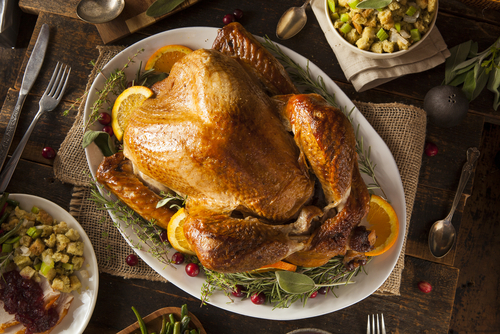 Thanksgiving dinner is all about the entree, and that’s usually a traditional whole turkey. Try this new butterflied turkey with rosemary gravy recipe to wow your friends and family with an innovative twist on that classic turkey taste. To create the brine, boil 1 1/2 quarts water with salt in a pot big enough to hold the turkey. Stir until salt dissolves. Stir rosemary, garlic and 3 quarts cold water into the pot and let cool. Add the turkey and let it chill, covered overnight. For the broth, boil all of the ingredients (except the mashed garlic, rosemary and flour) together. Simmer for 1 hour, then strain and discard the solids. Let chill. Place a rack in a large rimmed pan and set the turkey on the rack to drain. Pat the turkey dry and rub it with oil. Preheat the grill to 400 degrees. Turn off one burner and place a large drip pan on it. Fill the pan halfway with water. Place the turkey on the grill skin side up. Cook until the thickest part of the thigh reaches 175 degrees. Remove from heat and tent the turkey with foil for 15 minutes. Meanwhile, toast the flour in a 6-quart pot until browned. Pour in 3 cups of broth and whisk until smooth. Whisk the rest of the broth, garlic and rosemary into the gravy. Bring to a boil, then let simmer for 10 minutes (whisk often). Season gravy with salt and pepper before serving. Don’t forget to stop and see us at Fretz RV before you hit the roads in your RV this holiday season.